Say what, another post today? Why yes it is!! I'm excited to introduce a fellow nail blogger, Lacquer Slacker Liz. Her blog is always a pleasure to read daily because she is incredibly eloquent and has wonderful swatches and layering combinations. She's helping me out by presenting to you the last Hare Polish from The Tropics Are Calling collection, called Mad Chill. This is perfect timing for today's #31DC2013 Blue Challenge. This is my first guest post ever and I am commensurately thrilled and proud to be asked. Especially by Thithi, who has been so helpful and encouraging to me starting out as a polish blogger. Thithi's been doing a fabulous job featuring Hare Polish's latest collection, The Tropics Are Calling, here on pretty tough nails. So far you've seen Neon Palm, Dancing Bird of Paradise, Washed Ashore and Flight of the Flamingos. Today I have for you the final polish from that collection, Mad Chill. Mad Chill is a royal blue jelly polish filled with neon blue, ice blue and white glitters in various shapes and sizes plus silver microglitters and silvery shimmer. 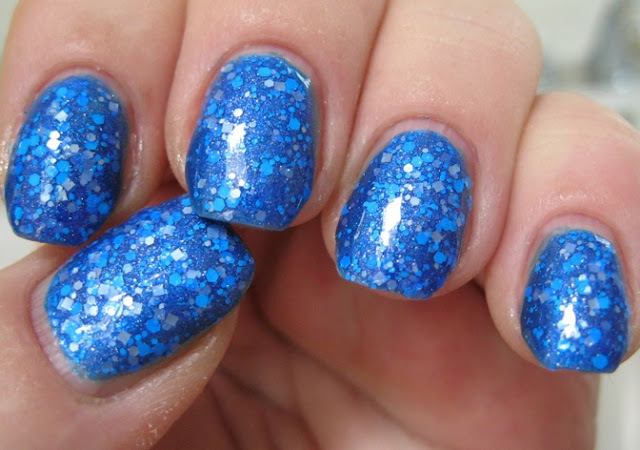 I like to layer glitter polishes so I set out to pick a royal blue to serve as underwear for Mad Chill. 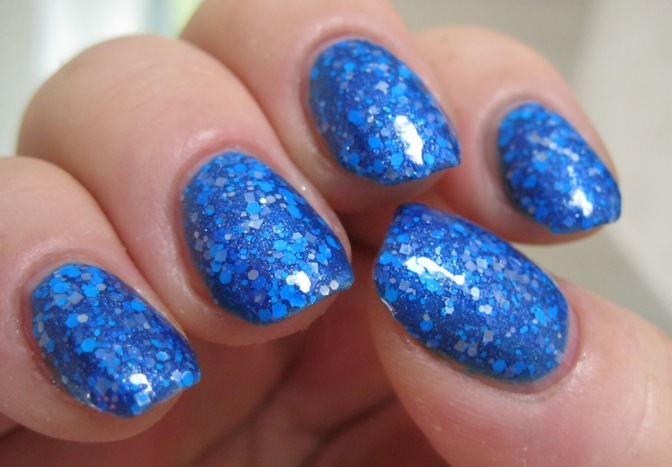 I decided on Sation Suede Shoes, a medium royal blue shimmer polish with scattered silvery shimmer flecks. Suede Shoes is a bit sheer with buildable coverage, and I used two coats plus a topcoat of Seche Vite as a base for Mad Chill. Were I to wear this by itself, I would definitely apply a third coat. I applied two coats of Mad Chill over my Suede Shoes manicure and added two coats of Seche Vite to smooth the glitters. 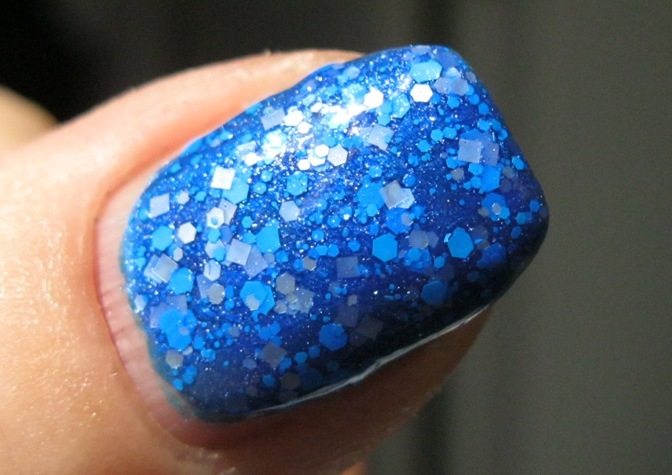 I did have a few instances of glitter stacking with Mad Chill, but I attribute this more to user error (overmanipulating the polish) than to any fault with the formula of Mad Chill, which I thought was excellent. There were a few errant glitters wanting to hang on the free edge of a couple of nails. My remedy was to gently file them away with a glass file and a rounding motion like the one used to seal the free edge of the nail after filing. I did this in between the two coats of Seche Vite, so that with the second any tiny scrapes would be coated and camouflaged. It worked quite well. 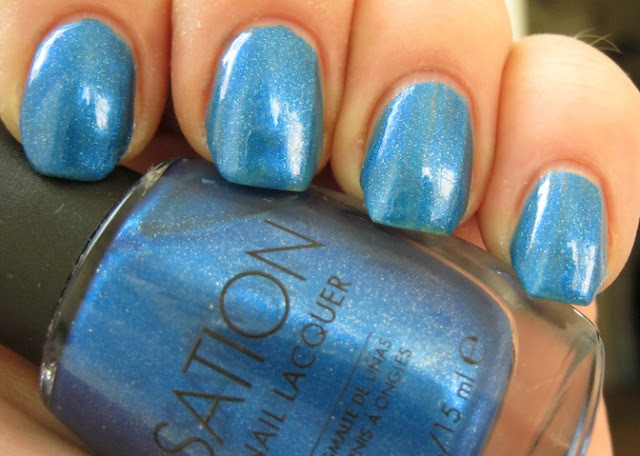 Mad Chill is a gorgeous highly decorative polish. On the nail it is a brilliant saturated sapphire, the kind of color that makes you hold your hand out at arm's length and waggle your fingers while gazing at them in blissful fascination. I love Nikole's ability to combine analogous colors, and she does it beautifully here. The blues she uses in Mad Chill give the impression of an iced Blue Curaçao liqueur cocktail, exotic and maybe a little dangerous. 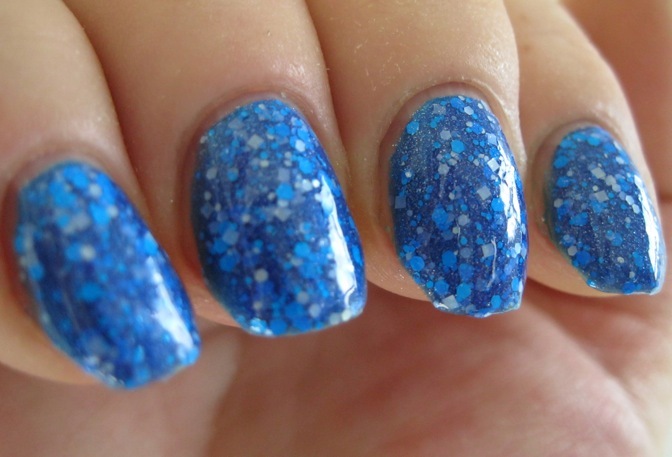 The glitters and shimmer appear to float over the blue pigmented base. This polish has amazing depth, reminding me of tissue paper collage. The silver microglitter is very reflective and sparkly in direct light and plays very well with the opacity of the colored glitters. All in all a beautiful and engaging polish as you'd expect from Hare, and such fun to wear. I especially love those square glitters, they really hit my sweet spot! Wow! Fantastic job Liz!! I really love your choice of base color and your pics of Mad Chill really show off its multifaceted sparkling gorgeousness. Hopefully you've enjoyed this post, and if all goes well, we'll be seeing more of Liz from Lacquer Slacker Liz. Big thanks to Liz for helping me out! !